The Ramayana and the Mahabharata (Mahabharat in Hindi) are considered the greatest epics ever in the history of human civilization and will remain so forever. There is a saying among the Telugus, historically known as Andhras, that if you want to eat something you should eat garelu (a traditional snack), and if you want to listen to something, you should listen to the epic Mahabharata. Until the modern era, the two epics were the main sources of folk entertainment and ancient history (Itihasa) to the people in the Indian subcontinent. They not only entertained the masses, but also enlightened them about duty, morality, and salvation and served as the starting point for religious practice. Unfortunately, due to prejudice and racism, the two epics did not make it to the popular kid's literature, school curriculum, or popular folklore in the West. Even the western film world chose to ignore them completely because of their underlying religious themes and spiritual values that are alien to the western world. The Biblical stories of Noah, Moses and Abraham, or even the works of Homer, Shakespeare, or any Greek or Roman writer of the ancient and medieval world pale in comparison to the complex characterization, poetic value, spiritual knowledge, structural complexity, recursive narrative, historicity, and the analysis of human conduct that are presented throughout these two great epics. Apart from its spiritual value, the epic Mahabharata also contains a lot of information about the ancient world and how people lived long before the great flood. It lists the lineages of 24 kings who ruled the earth in the beginning of the current human civilization, and how the epic itself came into existence through the enlightened mind of the great seer Vyasa. The Bhagavadgita, which consists of 700 verses divided into 18 chapters, forms part of the Mahabharata only, which makes the epic even greater than being the mere narrative of a war story. Truly, the Mahabharata is the original masterpiece in human history on war and peace. From the Mahabharata we learn that the story was originally conceived by the great sage Vyasa, also known as Krishna-Dwaipayana, as a poem. Since it was conceived by him as a poem, Brahma, the creator god, wanted the world to recognize it as a poem only. We further learn that having conceived it, Vyasa was concerned that it was humanly impossible to render such a large and voluminous work into writing by himself. It needed a super human effort for which divine help was needed. Therefore, he went to Brahma, the creator god, and sought his help. Brahma suggested that he should seek the help of Ganesha, the leader of the warrior gods (ganas), and the son of Shiva. After seeking his advice, Vyasa returned to his abode and contemplated upon Ganesha. 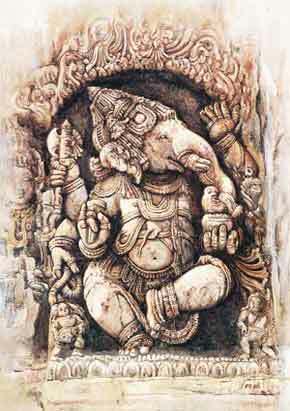 As soon as Vyasa thought of him, Ganesha promptly appeared before him. After paying his respects, Vyasa asked him to write the poem for him. Ganesha obliged on the condition that the narration should go uninterrupted and he would cease writing if his pen ever stopped writing. Vyasa assured him that he could stop writing the moment he did not comprehend any of his words or the narration. Ganesha obliged and with the utterance of Aum began writing Vyasa's narration. We have to understand why Brahma recommended the name of Ganesha for the purpose. Ganesha resides in the minds of people as the remover of fear and doubts. He quietly listens to everything we say and every prayer that we utter before he passes them on to other deities and their respective spheres. He also personifies the virtue of listening with devotion. It is symbolized in his iconography as the deity having the elephant ears. He listens with great reverence to his own father, the great God (Mahadeva) Shiva. Hence, Shiva blessed him and given him all the knowledge and the power to remove any obstacle, fear, or self-doubt from our minds. As a listener, Ganesha also personifies his mastery of the sruti literature, or the transcendental knowledge that is acquired through psychic hearing. The Vedas are considered sruti because they were heard psychically by the seers from the highest heaven of Brahman, where the Vedas said to exist eternally. There is another reason why Ganesha was chosen for the purpose. 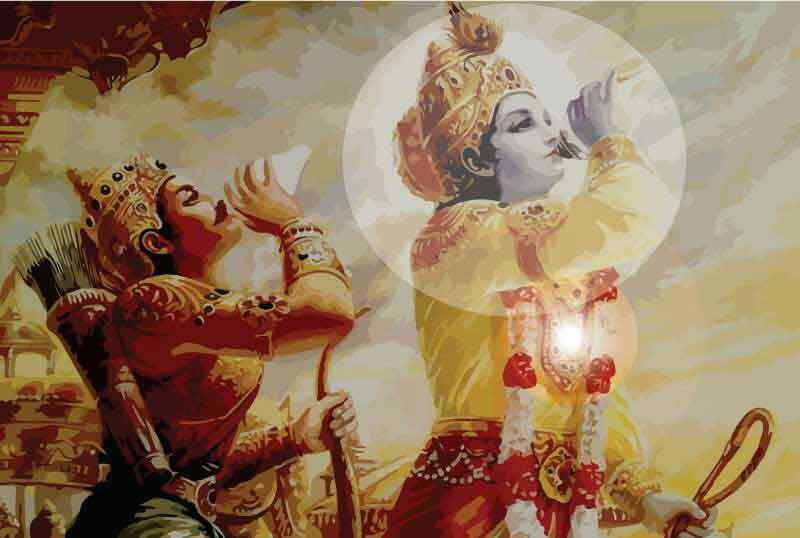 Mahabharata is about a war between two groups of cousins, with Krishna, the Supreme Self, as the witness. There is no better deity than Ganesha to render such a violent story. Outwardly, Ganesha may have a grotesque form, but he is a warrior god who marches ahead of his band of devotees into the battlefield to destroy the demons and enemies of God. Mahabharata emphasizes the unavoidable nature of suffering that arises from the violence in which humans indulge, while God himself may allow that violence to happen for the order and regularity of the world. Ganesha is the leader and foremost among the gods who are by nature warriors and act as the guardians of the worlds. They preach non-violence and exemplify highest virtues, but do not hesitate to fight the demons and evil people for the order and regularity of the worlds. They keep peace from a point of strength and on their terms, rather than making any truce with the evil forces unless they surrendered. The Pandavas were virtuous people and devotees of God, but they had to fight a terrible war as willed by God himself to protect the world from cruel and violent people. Hence, there was no better deity than Ganesha, who was the leader of such gods, to render the Mahabharata, a story on war as a duty, into human language. What we have today as the Mahabharata is a fragment of the epic that was originally conceived. In the Mahabharata itself it is stated that in the first stage, Vyasa originally conceived 24,000 verses in his mind and called it the Bharata. It was probably the earliest version, or the rough draft. Later he added to it another 150 verses as an introduction or prologue. He taught the early version first to his son Suka and later to some of his disciples. Afterwards, knowing that the intelligence levels differed in each sphere, he created four different versions of the work with a total of 6,000,000 verses. Of them the first version consisting of 3,000,000 verses was communicated to the gods in heaven (devlok). The second version consisting of 1,500,000 version was communicated to the ancestors in the world of ancestors (pitrlok), and the third version consisting of 1,400,000 verses was communicated in the world of celestial beings (gandharvalok). Finally, due to the limitations of the human knowledge and intellect, the fourth version consisting of only 100,000 verses was communicated to the humans in the mortal world. In today's world, the 100,000 may also be too much for the people to read. You can count on your fingers the number of people who might have completely read the original Mahabharata of 100,000 verses. Due to lack of time, nowadays many people get their knowledge of the epics from movies and television serials. These modern formats do render a good service. They introduce the epics to the people, who are otherwise disinterested to know them. However, since they are made with a commercial motive, they do not do full justice to the story. For example, the current television serial, Mahabharat, presents the story with a lot of glitter and glamour but with little reverence for the original intent and purpose of the epic. If you love the original, you will not be happy to watch it because it numbs your senses with Hollywood imagery and presents the characters in Greco-Roman styles as if to make people believe that there was an invasion of fair skinned Aryans in ancient India from the West and they resembled more like the Bollywod crowd from Mumbai. If Hinduism has to survive and maintain its purity, we have to preserve the integrity of the ancient history of India and the unique identity of its ancient civilization. We must not be ashamed of how we look or what faith we practice. Mahabharata means the great (hi)story of ancient Bharat (India) and ancient Bharatas (Indians). When the epic was originally composed, Vyasa, called it Bharata only, because it was a story of the kings and people of an ancient world who were descendents of king Bharat, who was the first king of the Indian subcontinent. For long a time, the epic is considered a history (itihasa) of ancient India. Its significance can be understood from the fact that in the Indian constitution, the official name of India is Bharat only. How the epic Bharata subsequently became Mahabharata is also explained in the first chapter (Adi Parva) of the epic itself. We learn that because of its spiritual value and content, the epic was deemed greater than all the four Vedas combined. The Vedas contain transcendental truths that are inviolable. However, the Mahabharata contains even more significant knowledge that can destroy sin and grant its listeners a place in the higher heavens or even salvation. We further learn from it that the creation of the epic led to a debate among the gods about its importance in relation to the Vedas and which of them was greater. To settle the matter, the gods assembled in heaven and weighed the pros and cons of both. Eventually, they concluded that in knowledge and substance the epic weighed heavier than the four Vedas combined with all their secrets. From then on, the epic became known as the Mahabharata, rather than mere Bharata. It means gods declared that the Mahabharata was the greatest (maha) of all works known in the world of the Bharatas.